Canadian Government offers a great opportunity of obtaining open work permit called Post Graduation Work Permit (PGWP) for the International Students after completing their studies in Canada. Are you eligible to apply for the Permanent Residency (PR) if I am Post Graduation Work Permit Holder? 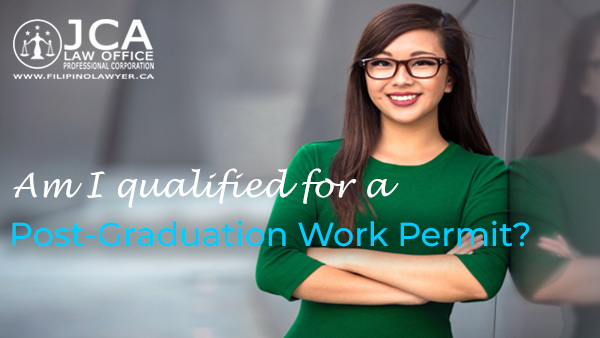 PGWP allows recent graduates to gain Canadian experience, which could grant you a decisive point for Immigration. Skilled workers (under NOC A, O or B) that gained experience through the PGWP may qualify to apply for permanent residency. Are you looking for an opportunity to immigrate after completing your studies? After graduation, you could obtain a PGWP as International Student for a maximum of three years. To qualify, you studied full-time in Canada and completed at least eight (8) months of the program. Also, you should be graduated from Canadian accredited colleges and universities or Designated Learning Institutions (DLIs). After your graduation or within 180 days, you should apply for written confirmation (transcript or an official letter) from the school indicating they have met the requirements for the academic program. You should have a valid study permit if you decided to apply for Post-Graduation Work Permit or PGWP. What are the types of colleges or universities that would qualify me for a PGWP? You should apply for 180 days after your school issues transcript of records to apply for PGWP. You have availed in the Government of Canada Awards Program funded by Global Affairs Canada (GAC) and any program under GAC. Completed the study in non-Canadian institutions. If you completed the study program in less than a normal length of the program, you are eligible for PGWP. For example, if you completed the one year in 8 months, you will still get the PGWP validity of one year which is equivalent to your study program. If 50% of your attendance is less than the length of the study program. The length of your study program is equal to the PGWP, and this includes both in-class and distance programs. If the distance presence is more than 50% of the study program, you, therefore are not eligible for PGWP. If you took an unauthorized leave from your study and if they found out you didn’t meet the leave conditions, you are not qualified to get the PGWP. However, there are some cases that you may be authorized up to 150 days and agreed on the conditions of your DLI or school. If you leave is authorized, you may still get the PGWP (see your school for these conditions). If you transferred between DLI or Designated Learning Institutions, the attendance should be combined with both DLIs for 8 months. In case you transferred to another institution which is not DLI, then we will consider the length of stay under the DLI you had attended. Your chosen program has an overseas requirement, you are eligible for a PGWP as long as it is credited by a Canadian school or DLI. Flight School Program. If you have this program, you should have completed the flight training course and now have a Canadian commercial pilot’s license.